The Gray Report: Immigration story has a happy ending. Three years ago I wrote about Johannes Reinhardt, a winemaker in New York who was denied a green card by the US government and might have been forced to go back to Germany. The post title was "USA to foreign winemaker: We don't need you." But the US government changed its mind. Reinhardt got the green card. "My wife and myself, we did two things: We prayed and we cried," Reinhardt said. "Our faith carried us through. Without it we would have given up." Reinhardt is the winemaker, for now, at Anthony Road Wine Company in the Finger Lakes. In the next month, he expects to open his own winery, Kemmeter, about 500 meters down the road. Proving the value to our economy of legal immigration, he expects to hire two or three employees. In 2010 Reinhardt was denied a green card by an unknown bureaucrat from the US Citizenship and Immigration Services in Nebraska. The USCIS didn't see "winemaking" as a unique skill needed by US industry. 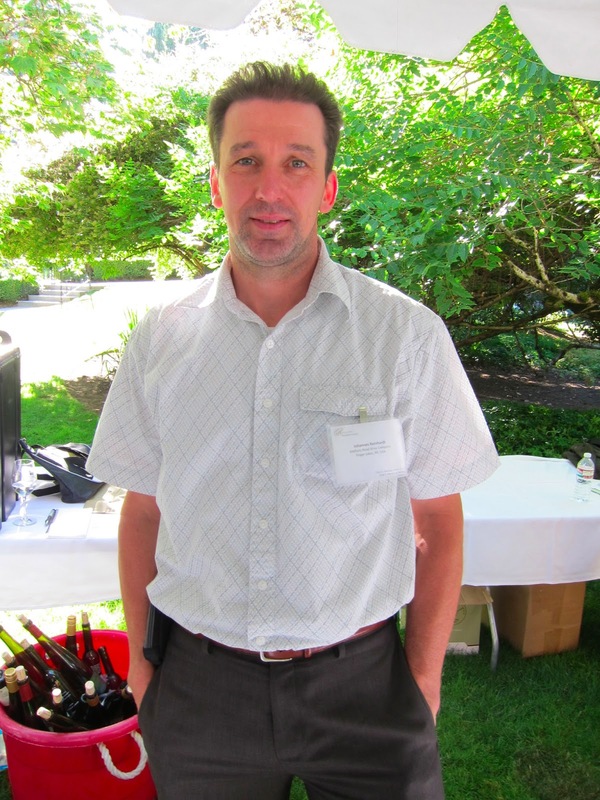 Reinhardt had a 6-year H1-B visa, but after that he was expected to leave -- despite the strong support of the Finger Lakes wine industry, where he shared his knowledge and creativity with Riesling. He couldn't stay on a spouse visa because he had married an Indonesian student of food science he met at Cornell. Reinhardt's case is not unusual. While the media frets about illegal immigrants, the USCIS has a long backlog for legal immigration applications. And take it from the husband of a legal immigrant: the process is mercurial and frightening. Just because you do everything right doesn't mean you can expect a green card. About a year after I wrote this post, Reinhardt received word that his application for permanent worker status had been approved. That was a great day for him, but it still didn't feel completely certain until the green card arrived in the mail. "We came back from vacation and found it in the mailbox," Reinhardt said. "We had a long joy and a special peace. We waited so long for it, and we were denied it, and maybe in the end that made it more special. If your life was a straight path all the time, you don't appreciate it. It's so much, so much to appreciate what we have, something we had been hoping and praying for." Everybody wins here. Johannes and Imelda Reinhardt get a new home -- correction, they get to stay in their adopted home, because Imelda got a green card as Johannes' spouse. Johannes gets a new business. The New York wine industry gets to keep one of its best winemakers. I got to try some Anthony Road Rieslings again this week, and they are delicious. Now Reinhardt can train more New Yorkers to make wines like them. I'll be honest, I got a chill down my spine shaking Johannes' hand at Riesling Rendezvous this week, and not because I'm a proud American and I was thrilled that my country made the right decision. I was thrilled for Johannes and Imelda Reinhardt. They get -- I get -- we all get -- a truly happy ending.